Are you getting the most from the internet for your business? 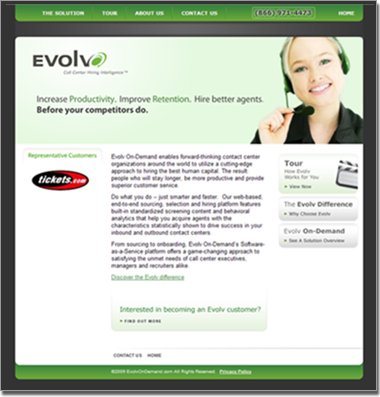 Evolv On-Demand was founded by a team of former call center executives, selection science specialists and seasoned enterprise software professionals. Their experience and expertise are focused on delivering measurable business improvements for clients through more effective call center hiring management. Evolv On Demand approached Lurus looking for a new, fresh look. We designed a new layout for the website and built in our content management system to enable them to take control of their site. The site also has an admin area for secure communication with their clients as well integrating custom built flash product demos.